There are definitely some night cards that have decent costs to begin with, and we can search this out if necessary. But I think there are plenty of other supports I'd want first. Reducing costs only helps if I play out loads of day cards, and that is risky given a single niht card takes all out in 1 go. Not impressed really. This is one of the worst agency cards out there. In-faction there are only 2 day cards but with the highest cost being 2 they don't need any reduction. 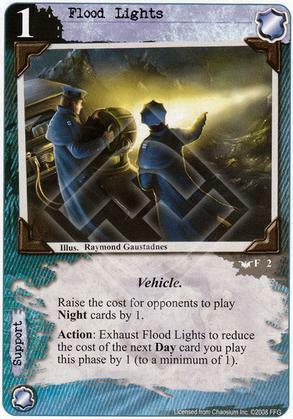 Raising the cost of night cards isn't worthwhile, decks tend to only run a few day/night cards and most don't run any. It's a meta call as to whether this is of any use to you. The vehicle trait got its first bit of synergy in the agency deluxe box, you can now tutor for this using motor pool. The only reason I would ever consider this is if my deck was very reliant on day, possibly combined with the new resource denial cards. Flood Lights is worse than its partner Everlasting Night due to the lack of expensive Day cards in-faction... or in general, really. There are a ton of effects that trigger off of it being day, but not many actual day cards. Making night cards more expensive is in about the same boat. It'll trigger once or twice if you're lucky, and never if you aren't.